This week's cool idea is one from the past. Seniors/Volunteers for Childhood Immunization is an intergenerational immunization program based in Texas. 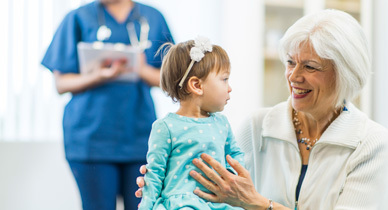 The Seniors/Volunteers for Childhood Immunization program strives to encourage the timely receipt of immunizations for pre-school aged children in Texas and beyond. Senior volunteers possess the experience of witnessing the devastating effects of diseases that are now vaccine preventable. Their understanding of the critical need for immunizations, coupled with their unique skills, compels them to become devoted advocates to the mission of ensuring the health of the youngest members of their local community. The program trains older adults to educate new mothers in hospitals or birthing centers about preschool immunization. Consenting mothers are enrolled into a community-based immunization reminder program. Seniors/Volunteers for Child Immunization also calls or sends cards reminding mothers of their childrens' two, four, six, and twelve month immunizations, and evaluates their success based on official immunization records. Intergenerational Connections Facebook Group. We want to highlight innovative age-optimized programs and practices through our blog, social media and weekly e-newsletter! Share the inspiration.